Legend has it that William the Conqueror watered his horse at a dew pond where the Knockholt Beeches now stand – the highest point in the highest village in Kent. King William would have called the place Noccolt, or perhaps Nokholte, our modern spelling not being used until 1798 and not generally used in Parish Registers until about 1824. Prior to his landing, too, very little is known about the village other than its name was probably derived from its position – 'nok' (corner) and 'holte' (copse) – perched on one of Britain's oldest routes, known as the 'Trackway.' It ran mostly over hills to avoid the dangers lurking in the surrounding huge forest. Knockholt was originally centred on our simple, but beautiful, St. Katharine's Church, which was built in the reign of Henry III. It was only later that Knockholt Pound – originally just that, a pound for stray animals – became the focus of development. Knockholt runs from Scotts Lodge to Rushmore Hill and can be viewed as a linear village. But for the people who live here today, there's no distinction: it's all 'Knockholt'. By their nature, villages and village life are slower to change than urban areas and tend to be more people-oriented. Certainly, Knockholt can be seen that way as most of the histories revolve around the families who lived here over the centuries. Until relatively recently, they depended largely on agriculture and of the 290 males in the village at the 1851 census, 77 were agricultural workers. There were 11 farmers, supported by ancillary trades such as blacksmiths and saddlers, and of the 1,701 acres in the parish, 1,668 comprised woodlands, pasture and arable land. That's changed of course. In 1820 there were 83 dwellings in Knockholt, though there was a steady rise to about 240 over the next 90 years, a nearly threefold increase. Over the past 90 years, building of new homes slowed and today we have around 450, including some 13 listed buildings, most of local stone and flint. Despite that, Knockholt is not listed a Green Belt area of Outstanding Natural Beauty for nothing and still has a remarkable legacy of open space with an admirable network of footpaths from which to enjoy it. 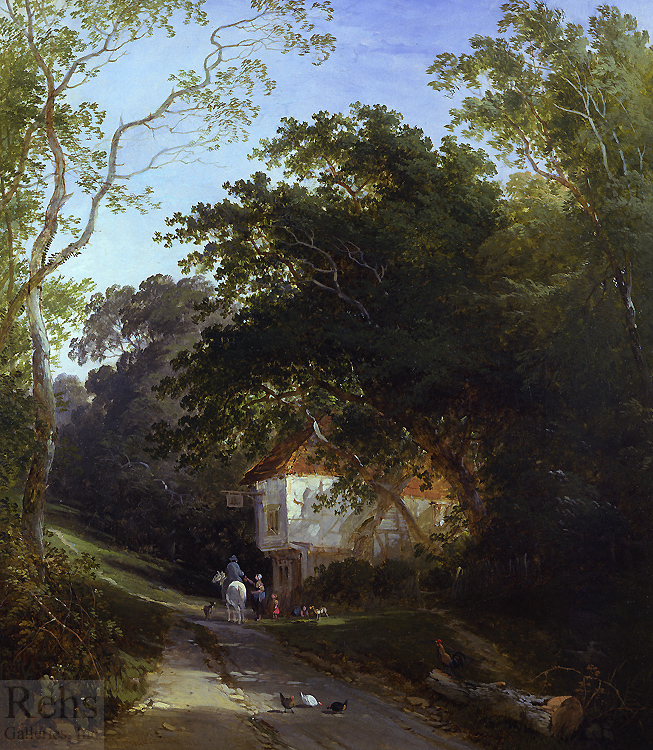 The painter Henry John Boddington (1811-1865) certainly appreciated that beauty: his A Lane at Knockholt, Kent (1841) finds many echoes in the village of today. Other famous people have also drawn inspiration from Knockholt, not least William Frederick Wells who lived at Ashgrove where his friend J.M.W.Turner was a frequent visitor. It was here, in October 1806, that the idea of the world famous Liber Studiorum was suggested to Turner by his host – the series of six Knockholt Studiescan be found in the British Museum. Ashgrove was also home to Dr. Samuel Johnson's famous 'Summer House' for 136 years before its restoration and removal to Kenwood House where, sadly, it burnt down in 1991. Johnson was a great friend of Hester Thrale, whose daughter Susanna bought Ashgrove in 1807 and moved the Summer House, where Johnson spent many happy hours, from her mother's old home in Streatham to Knockholt. It's possible, though not recorded, that Johnson visited Susanna in the village. More recently, as the railway arrived (the station first called 'Halstead for Knockholt' in 1876, changing to 'Knockholt' in 1900) village resident E.S. Nesbit set her famous novel The Railway Children (1906) in and around the station. At that time, a battle was going on as Knockholt had been 'moved' from Kent to Bromley and London. Not the first battle villagers fought and won for what they held dear, and we were formally returned to Kent in 1899. More serious struggles lay ahead. The two world wars, commemorated by our recently restored Memorial at the church, made their mark. In the Great War, 182 Knockholt men served, 24 of them losing their lives. Of them, Major Alexander Malins Lafone of Court Lodge won the Victoria Cross. Major Norman Smithers, who won the Military Cross, was more fortunate, living on to become supervisor of the special constabulary during World War Two. That war also took its toll, 17 Knockholtians dying, including the Rev. Charles Hobley who was killed at the rectory during an air raid. Perhaps the best kept secret of the war, however, was that Knockholt's Ivy Farm was an outpost of Station X,the Bletchley Park-based centre that broke the German Enigma Code. People change, but a remarkable number of old Knockholt families live on here and though agriculture is no longer the main source of employment, we are not a 'commuter' village. People live full lives in Knockholt, evidenced by the plethora of social, sporting, artistic and other societies and organisations listed in our Parish Magazine. Our bi-annual Carnival is also the biggest of any village in Britain. We take pride in our village and its way of life and while we are not against change, continue to fight to retain not just those links with the past, but what's brightest and best from modern times – the famous 'Battle of the Phone Box' in 1987, to retain the red box synonymous with Britain, is a case in point. What lies ahead? Who knows, but we are determined that the quality of life in this village – and that means the quality of any future planning – will be our legacy for the generations to come. *I am indebted to Sir David Waldron Smithers, late president of The Knockholt Society, for both inspiration and for his book A History of Knockholt in the County of Kent (Dragonfly Press, ISBN 0-9513500-4-8), without which much of the above could not have been written.